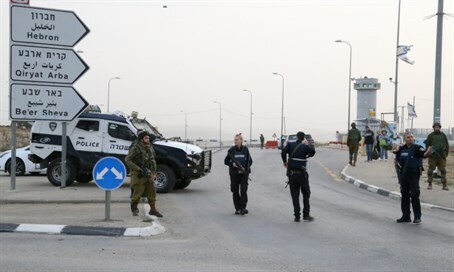 An Arab terrorist tries to run over victims north of Hevron, is shot by security forces. An Arab terrorist attempted to conduct a car attack during Arab riots at Halhoul, located north of Hevron in Judea. The attack unfolded along Route 35; the terrorist was shot and seriously wounded by Haruv soldiers from the IDF's Kfir Brigade before being able to cause any injuries. "The force identified the threat and responded with fire toward the assailant," a military spokeswoman told AFP. "The attacker received medical care at the scene and is now being evacuated to an Israeli hospital." She has been transferred to Hadassah Ein Kerem Medical Center, Arutz Sheva has learned. Shortly afterwards, she was identified as a 72-year-old woman - the oldest terrorist since the current wave of daily attacks began. The road is currently closed to traffic as police carry out an investigation. Just two days ago, an Arab terrorist ran over a Border Police officer at the same site, critically injuring him. Security forces eliminated the terrorist at the scene.